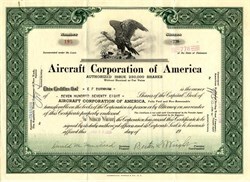 Beautiful certificate from the Aircraft Corporation of America issued in 1928. This historic document was printed by Hasbrouck, Thistle & Co. and has an ornate border around it with a vignette of an eagle. This item has the signatures of the Company's President, Berton L. Wright and Secretary, Donald M. Muirhead and is over 84 years old. The company manufactured and marketed a two seated monoplane known as the Airco - Scout which was used primarily for sport and training purposes. The company's plant was located in Milford, Connecticut.